In the acronym, F-R-U-I-T, I created in my Words of Wisdom segment, for what word does the R stand? Mark said he wrote “And You Never Even” one afternoon in Central Park in the spring of 2012. True or False? Which instrument is Mark’s primary instrument, the one on which he said he feels most comfortable? Piano or Guitar? For how many of the four songs Mark performed did he use a capo on his guitar? 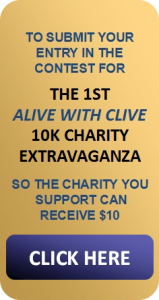 To submit your Entry Form in the Contest for The 1st Alive with Clive 10K Charity Extravaganza after you watch the 1st of 2 shows featuring Mark Farmer on Alive with Clive so the charity you support can receive $10 if funds for distribution to charities are currently available, click here.